(HARLINGEN) – It was an emotional ceremony for the 20 Texas State Technical College Vocational Nursing graduates who were recently pinned and officially welcomed into the profession during the program’s annual pinning ceremony. Rodriguez graduated with his certificate in vocational nursing in 2015 and works with Windsor Atrium, a nursing home in Harlingen. He said it was an honor to have been invited as a guest speaker and he is hoping that some remember the wisdom he shared. For Maria Cisneros, the class’ valedictorian with a 3.8 grade-point average, the wisdom was taken to heart. Cisneros, a mother of two, reminisced during her valedictorian speech about her grandmother, who inspired her to be a nurse. She first graduated from TSTC in 2015 when the certified nursing assistant program was offered. 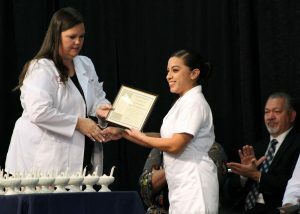 And now the TSTC vocational nursing graduate plans on returning to campus next year for the vocational nurse to registered nurse transition program. This is a sentiment that many could relate to, making the moment bittersweet. Through tears of relief and joy the ceremony continued with remarks from TSTC administration and faculty, the anointing and blessing of hands by Pastor Dan Anderson from The Bridge-Rio Hondo Baptist Church, a first for the program, and a candle lighting ceremony, which marks the passing of the light of knowledge. 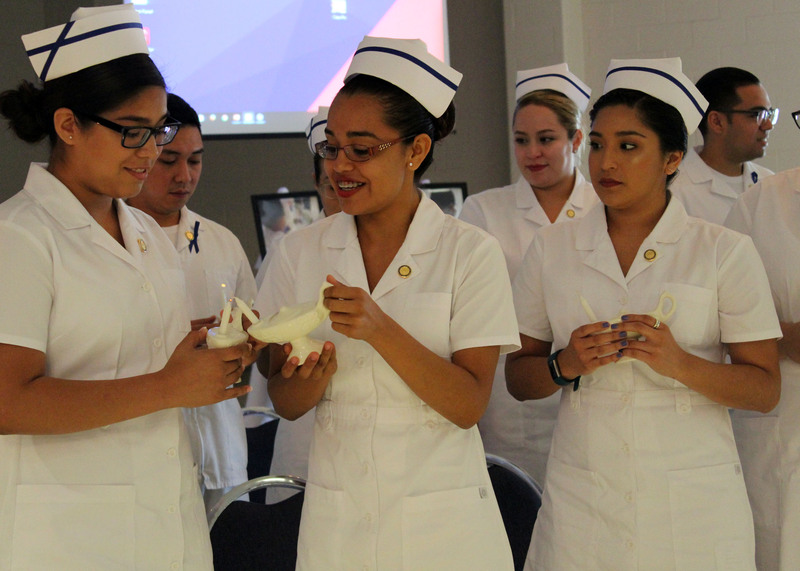 The Vocational Nursing Pinning Ceremony is held twice a year during the fall and summer semesters and is described as a rite of passage by TSTC Vocational Nursing Director Heather Sauceda. For more information on the Vocational Nursing program at TSTC, visit tstc.edu.